With a new team and a new initiative with the 21st-Century Musician, the DePauw University School of Music has positioned itself to create musicians of the future. 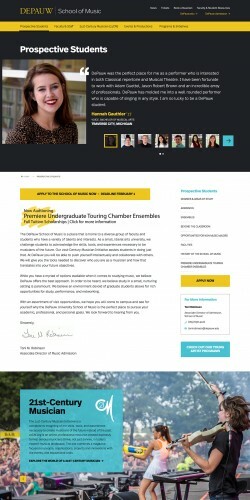 But the website wasn't doing enough to reflect the energy and vitality of DePauw's innovative approach to music education. 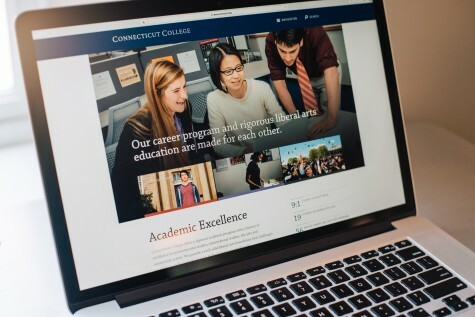 Leveraging audio and video content within a bolder, more contemporary design system, the Fastspot team provided an appropriately fresh and dynamic online experience to capture the tenor of the School's vision of the modern classical musician. 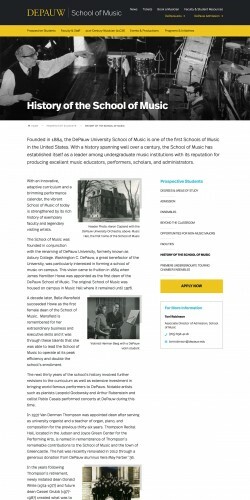 An interactive homepage feature uses video and audio to demonstrate the "musicians of the future” exemplified by DePauw’s ethos. Dynamic multimedia content gives prospective students an immediate sense of what DePauw has to offer, and is a differentiating site feature compared with nearly all of the School’s competitors. 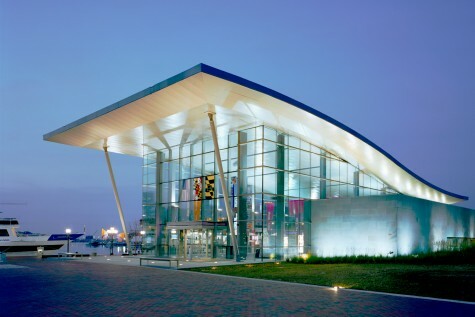 Giving the new site a contemporary look and feel was an important aspect of the project. 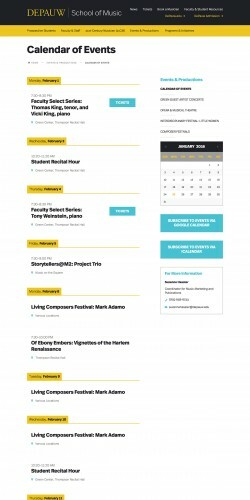 It had to incorporate the 21cm.org brand within DePauw’s style guide, while successfully portraying a school on the cutting edge of contemporary music. The color palette keeps the site firmly rooted within the DePauw brand, while bold typography, vivid photography, and a more defined content strategy add contemporary energy and sophistication. 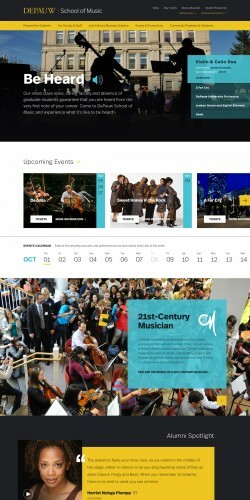 Promotion of DePauw School of Music events and productions was another driving factor in the redesign. 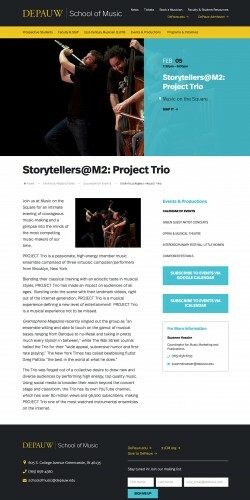 This was achieved by giving more prominence to upcoming events in the homepage hierarchy, designing more intuitive calendar tools, and allowing content creators to add richer visual content to event detail pages.